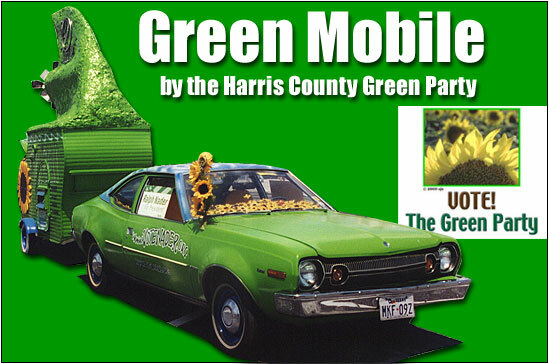 Harris County Green Party members wanted a fun way to draw attention to the campaign, our statewide candidates and Ralph Nader and so the Green Mobile was born. It's a 1973 AMC Hornet donated by a local Green supporter, with a loaner trailer owned by local Green art car artist Tom Kennedy (creator of Ripper the Friendly Shark, among others. Hence the trailer fin!). The vehicles were decorated by local Greens and art car artists during several weekend work days. 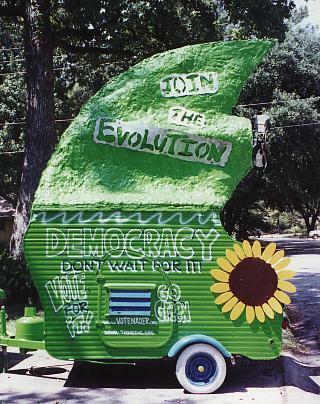 The Green Mobile is used as a rolling booth and billboard for the Green Party. And like all art cars, The Green Mobile is a work in progress. We took the car/trailer to the Ballunar Festival at NASA, where we were almost kicked out because the staffers said political parties could not sell stuff or campaign, since it was federal property (the Hatch Act, they quoted)... One of the volunteers in attendance that day is a lawyer... He thought the staffers were mistaken and called his boss for verification. She said: a) the Hatch Act applies only to federal employees campaigning on federal property and b) it was an event open to the public, meaning it was technically temporarily not federal property, so we were talking free speech issues! When they threatened us, the Art Car Museum Education and Events coordinator Bryan Taylor said: "They leave, we all go!" There were about 10-12 other art cars in attendance. The staffers came back later and said they'd let it slide this time. United we stand! We went to the Galveston Labor Day Luau where extremely friendly mounted officers gave us permission to park right in front of the entrance gate. Everybody who came to the Luau saw the car. Those same officers allowed us to gather signatures for the "Let Ralph Speak" debate petition right at the entrance. On the way home, I was pulled over by a Clear Lake officer. He said in a Texanized twang, "M'am', did you realize your inspection sticker and registration are delinquent since 19 and 99?" I explained the car was donated, and we were in the process of getting the paperwork in order. He nodded and then proceeded to ask me a bunch of questions about the Hornet. Did he use the expired stickers as an excuse to stop me and talk about the car? It has tooled around downtown Houston: During pre-game at Enron Field, driving through the baseball field area, an officer directing traffic stopped us, even though there were few pedestrians waiting to cross. The people were waved over and then the great big police officer rumbled over to the car (walking only as a police officer can: that half swagger, half mincing way they move). We thought, oh boy. He's going to point out the still illegal registration and inspection stickers! Instead, he leaned over, stuck his head in the window and said with a big grin: "Thought I'd stop you so people could get a look at your machine." Amazing! We took it to the Sugar Land Music Festival, where a woman walked out in front of it on the street, held out her hand to stop it and then handed the driver a 20-dollar bill. Said she loved what Greens stand for and she loves Ralph! We've visited the Festa Italiana, the Caribbean Festival, the Downtown Stomp Around Gallery Hop, the Mediterranean Festival, Hermann Park, Miller Outdoor Theater, The Zoo, the Heights, West University, Fifth and Third Ward neighborhoods, Fun Days in the Park, the Journey of Hope anti-drug rally and the Heights neighborhood parade/festival. We're hitting more neighborhood "Cop Shop" parades in the next couple of weeks, as well as the Conroe festival and the Seabrook Music Festival and Westheimer Street Festival in Exile.